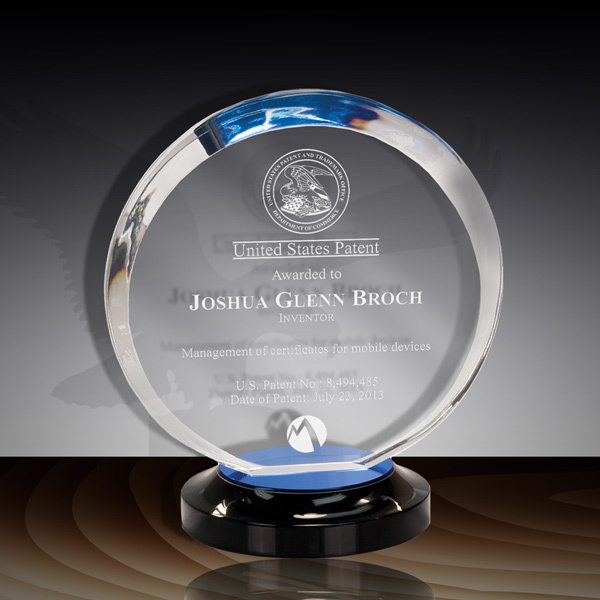 Illuminate your shining star inventors with this premier acrylic patent award. 3/4” Thick clear acrylic with attractive bevel creates a HALO effect. Black Acrylic Base with your choice of either a blue or gold Mirrored Surface. Available in two sizes (7" & 8"). This Patent Award - Acrylic Desk Illumination IP ILL-77 is part of our Patent Desktop Award Series of products, check out other products & options available in the Patent Desktop Award Series of our selection. This Patent Award - Acrylic Desk Illumination IP ILL-77 can be modified to your requirements and is available for your corporate award programs.